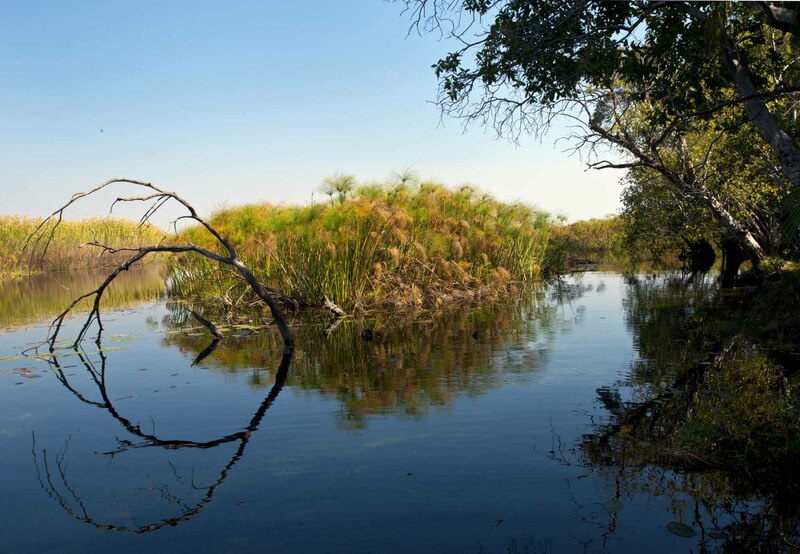 The Okavango Delta in Botswana, Africa, known as one of the most exciting wildlife and bird-watching locations on the planet, turns out to also be one of the most fascinating diving locations conceivable. 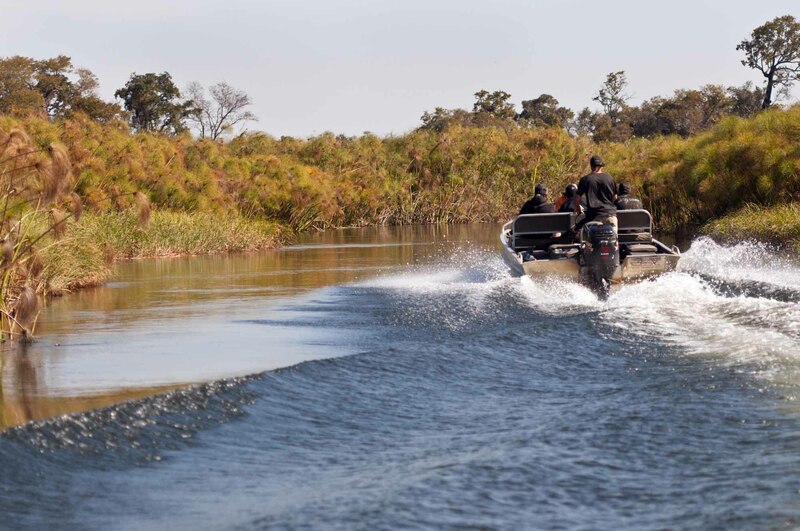 Imagine spending your days in a small boat, travelling along the delta’s central river and hundreds of small tributaries, the banks lined with tall stands of papyrus, cane and arching trees; sandbars and grassy banks here and there. As you move, watching, you pass birds by the thousands – African Fish Eagles, kingfishers, storks, egrets, herons…the sightings go on and on. 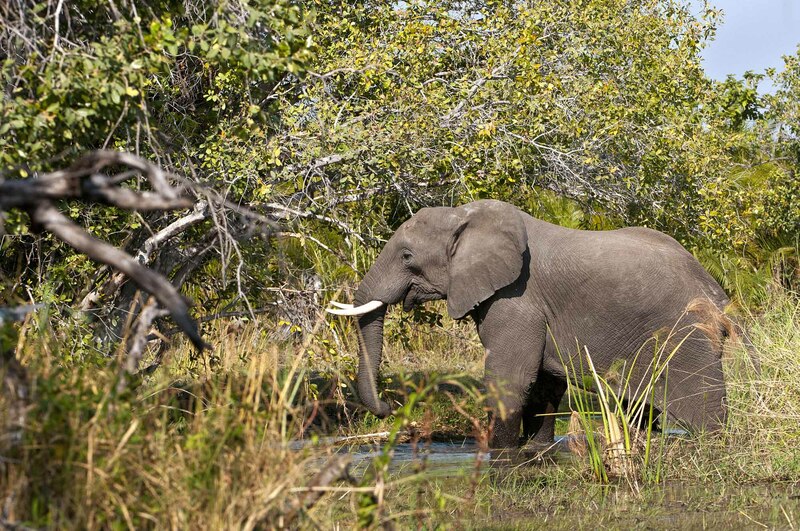 And, occasionally there are big animals as well, especially elephants and hippo. 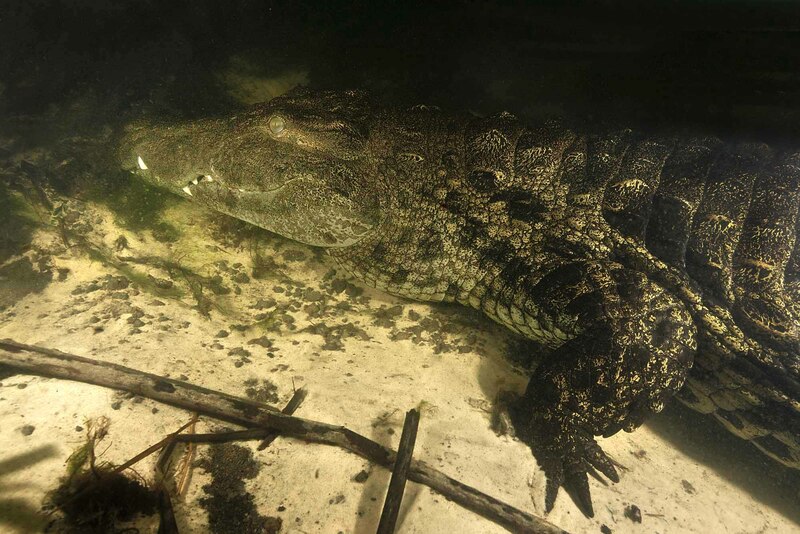 Then… you spot what you have been looking for – a 12 foot/4 meter-long Nile Crocodile, basking in the sun. At your boat’s approach, it slides into the water, disappearing from sight. You watch carefully to see which direction it heads, then, out at mid-stream, three divers – two guides and you, the photographer – back-roll simultaneously and go straight to the bottom – there is no time spent on the surface when silhouette-hunting crocs are near. Slowing yourselves on the clay bottom in the 1-2 knot flow, you make your way through the 55 degree F/13C water to near the bank, where the crocs will go to hide, usually at some 10-15 feet/3-5 meters down. 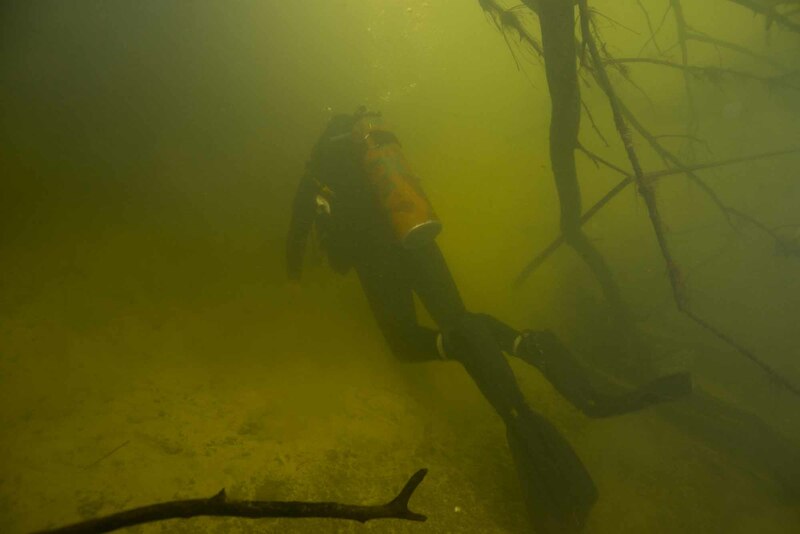 The visibility is but a body length or two as you peer through the murk among the fallen trees, papyrus roots and irregular bottom terrain, searching for a croc’s shape. Suddenly, there’s the startling, jaw-dropping vision of a prehistoric creature, huge on the bottom, its rough, leathery hide dinosaur-like, its glare-white teeth shining oddly in the gloom. Razor-sharp impressions implant in your mind’s eye. The legs and feet are oddly muscular and over-sized, toes spread to grip piercing, black claws into the bottom in the fast moving current. 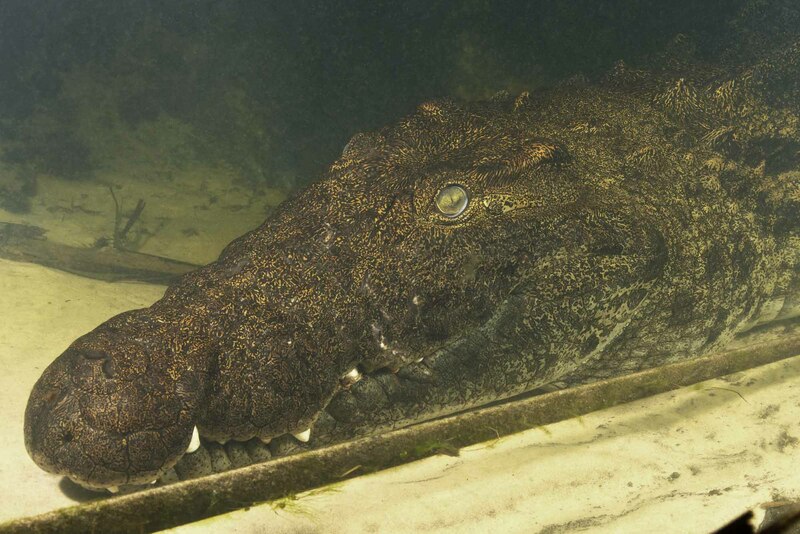 Once the croc has moved on, or if you hadn’t found one within 10-15 minutes, you move back out to mid-channel to about 20-30 feet/6-10 meters of depth, where the boat moves in above you. Again simultaneously, the three of you take off your scuba gear at the bottom, ascend straight up under the ‘shadow’ of the boat, hand up your cameras and equipment, and immediately pop over the side. 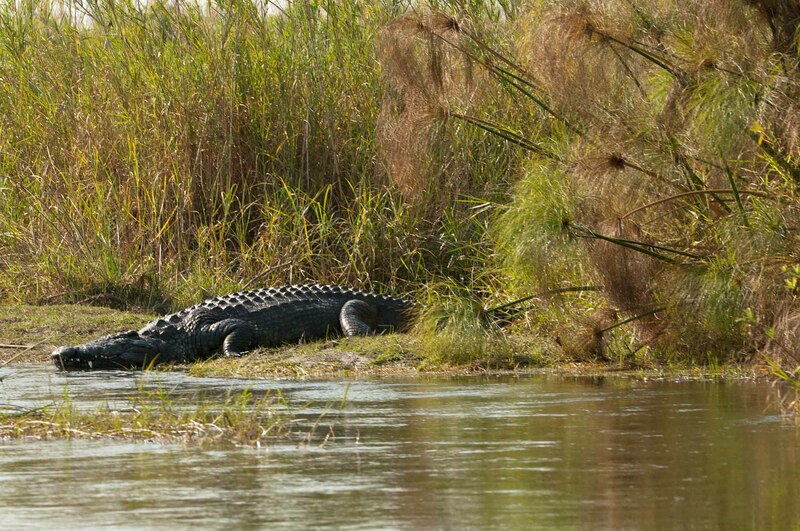 There, grinning uncontrollably, you catch your breath for just a moment… before starting the search for your next croc. Whew.